This one's been out for a few years, so I'm giving it the slightly more lightweight treatment, which is fare because as good as the game is, there is not a ton of meat on its bones. For starters, this is not a game that is meant to be played in single player. I can't imagine trying to enjoy this game fully if you do not have an Xbox Live Gold account. My son loves shooters like this, and I tend to enjoy them as well - we both enjoyed this title, though he definitely got more mileage out of it than I did (using my account because he does not have Gold). The key to this game is the multiplayer, and to that end it is pitch perfect in a lot of ways. The title's about three or four years old now so the graphics tend to look a bit dated for this generation of console, but the lightning effects are appropriately creepy and it handles the massive amount of movement (ie: ranging zombie hordes) very well. The music and voice work add a movie-like quality to this title. 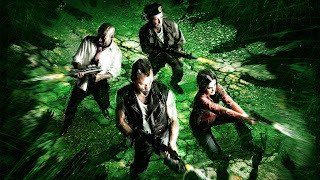 I am a bit of a sucker for zombie survival movies and shows, and I felt like Left 4 Dead definitely nailed the particular vibe. The game plays pretty smoothly. 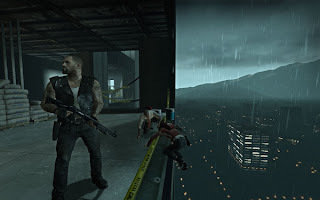 It is a survival shooter, and the controls are fairly smooth and even now there are people playing it. My son fired it up about a month ago and still immediately found a match to participate in. Considering the game can be had for about $10 new, that is not a bad value. There is a lot of replay to be had here, which is good since there really are not very many scenarios/maps. I wouldn't toss a little kid in front of it - it is rated M for Mature for blood, gore, intense violence and language. My son handles his content pretty well, being a teenager now (and therefore making me feel very old, but that's an entirely different post), but I wouldn't let my youngest daughter who is 10 probably play it. Not a bad way to get together with some online friends and kill time. I haven't however, had a chance to try the sequel, which I hear is even better than this and might make for a better investment depending on cost. Glad to hear you've been playing some Left 4 Dead! You nailed it in your review: the game just isn't as fun to play by yourself. I've got the PC versions of L4D and L4D2, mainly because I've been avoiding paying for Xbox Live for the past 6 years haha. If you get a chance you should definitely check out L4D2, the added Special Infected are brutal, and the additional weapons (gotta love the chainsaw!) are a lot of fun. I have been eying it for some time, and I know my son wants me to pick it up. 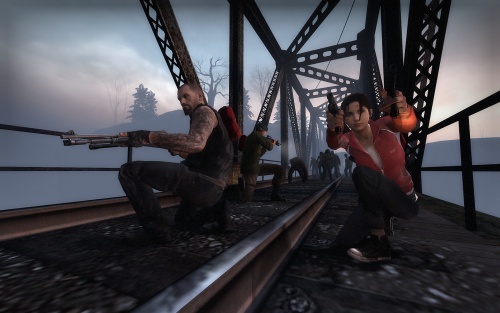 Everything I have heard about L4D2 sounds awesome, so your endorsement certainly doesn't hurt. :) Thanks for commenting! I am right there with you on the PS3 on that front. Unless it's an Xbox exclusive like Halo or Gears, if the title has multiplayer, I get it for the PS3. It doesn't directly affect me, but my kids don't have Gold accounts so if they want to play online, PS3 is the key. If you are interested in L4D and don't have a gold account, do you game on your PC? If so, those games get pretty cheap on Steam sometimes (I think last year around Halloween they were like $5 each) and you can play them for free online that way. I've got the PC versions of L4D and L4D2, mainly because I've been avoiding paying for Xbox Live for the past 6 years haha." Same here, and to think I not only payed for it on the original for a few months, but enjoyed my brief time with it. I'm just too cheap these days! Thanks, or maybe not thanks (remains to be seen), to Chalgyr in large part, I have recently picked up PC gaming again through Steam. I haven't played this one yet, but I found it interesting that this game and Call of Duty: World at War released the very same year basically within a month of each other, and they both had "zombies" and modes that have now come not only expected in some games, but some gamers are more excited about those modes than the general game-play itself. Any games that are on all platforms, I get them for the PS3 for that very reason that I can play online. For Xbox I stay with exclusive even though I won't play multiplayer since I will be missing out on it, which is fine since I prefer to play alone than with cry babies online who will just ruin my online experience. I don't play PC games since I only have a laptop and my laptop isn't the best for gaming sadly. Maybe in the future I'll get a good gaming PC. That was me for years - I only a year ago and some change got a PC that could be used to play games and the like. I can tell you this - it's an excellent source of cheap gaming though. I discovered Steam and built up a PC gaming library that's pretty large now.